Western Isles MP Angus MacNeil said: “This report shows how badly RBS has dealt with the situation and taken no account of the communities, many in remote areas, that will be affected. He was backed in that call by Ian Blackford, the leader of the SNP in London and the Ross, Skye and Lochacher MP, who said communities had been badly let down. 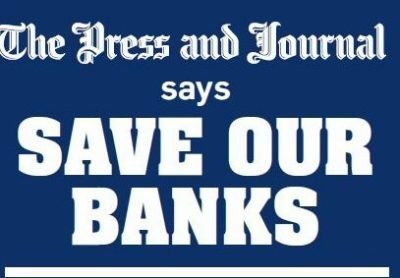 Mr Blackford said: “Neither the RBS management nor the UK Government has shown any interest in the communities that will be badly hit by the closure of their local branches. Banff and District councillor Glen Reynolds said closure would have “a massive impact on the local economy in Banff. “There has been a total lack of humanity on the part of RBS to engage with small local communities to address their specific needs,” he said. Aberdeen North MP Kirsty Blackman said that as the UK Government was the majority shareholder in the bank, it “should be applying pressure to prevent these closures in Aberdeen, the north-east and the rest of Scotland”. She said her biggest concern was “for the most vulnerable customers who may find it very difficult to travel to further away banks or access online banking”. A reduction in RBS branches across the north east is also expected to have knock-on effects in Moray. Banks in Dufftown and Lossiemouth were shut several years ago with communities now served by the mobile service – now itself being downgraded to meet demand for the service elsewhere. Speyside Glenlivet councillor Louise Laing believes geography has not been taken into account, saying: “They haven’t thought it through for Speyside, they see the distance between the remaining branches but they don’t think about getting from place to place.